A group of illegal Israeli colonizers cut, on Saturday at dawn, dozens of Palestinian olive trees in ‘Arraba town, south of Jenin, in the northern part of the occupied West Bank. Media sources said the assailants invaded an orchard, owned by a local resident identified as Nathmi Dheidi, near the illegal Dothan colony, which was built on Palestinian lands. They added that the colonizers cut dozens of olive trees, which were planted approximately four years ago. Nathmi said that attack was not the first, as the colonists previously targeted his land, and several other orchards and farmlands in the area. In related news, Israeli soldiers invaded Ya’bad town, southwest of Jenin, before invading and violently searching many homes, and interrogated several Palestinians while inspecting their ID cards. 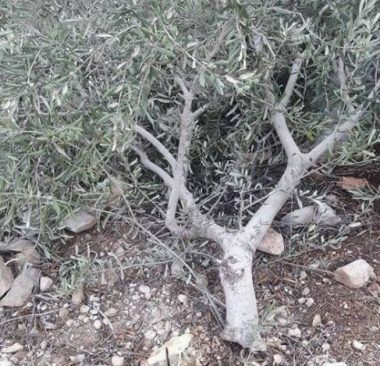 On Friday, Extremist Israeli colonizers chopped down 200 olive trees belonging to Al-Lubban Ash-Sharqiya village, south of Nablus, in northern West Bank.